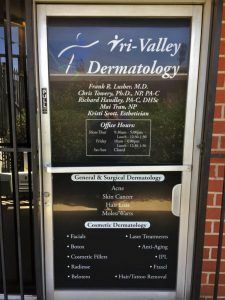 Tri-Valley Dermatology and Laser Center is a skin care clinic that has a location in Mission Hills, California. They contacted us because they wanted to use their door space to advertise while helping customers and potential customers find the location. 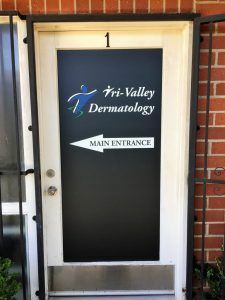 Tri-Valley Dermatology and Laser Center offers a wide range of general and cosmetic dermatological services so they wanted to list the different services that they offer on their front door. Since they wanted to display a lot of information that would fill up the whole glass, we decided to do full a window graphic using perforated vinyl so they could still see out the window clearly. Due to the perforation, it’s a full image from the outside, but you can still see out the window from the inside. We use this for full window graphics on exterior windows and vehicles. The first thing you want to incorporate into your window graphic design is your company logo. We also included a list of the names of the doctors along with the office hours on the top half of the door. For the bottom half, they wanted to advertise the different services they offer. All of this information was digitally printed onto perforated vinyl. The proofing process is very important because this is where the client makes sure that they are happy with how the product will look before we start making it. We went through a few proof revisions to add a few names and change the formatting of the services to make sure the graphic would look exactly as they envisioned it. Aside from an existing blade sign, they didn’t have anything advertising the location of the office to this will be sure to help new and existing customers find the business. Whether you’re looking for a full wall graphic or some digital prints, we can help you design something that will look great and bring attention to your business.